The indicator light flashes red when you have pending voice messages. (Learn how to Access your voicemail). Registered line : Your phone is successfully connected to the Skype for Business system. You can make and receive calls. Unregistered line : Your phone is not registered on the Skype for Business system. You cannot make or receive calls until you sign in to your phone. Voice mail : You have a voice message. Depending on which feature you are using, the soft key commands will be different. The phone screen shows what each soft key does. Multi-colour LED lights display the call status. Solid green: An active call is in progress. Fast flashing green: The other party placed the call on hold. Flashing red: You placed the call on hold. To select character input style: Press the Encoding soft key, use the up/down arrows to select character style (upper case, lower case or numbers), then press . To switch to upper case while typing: Press the relevant letter’s button on the keypad until the correct case letter is displayed. To make a correction while typing: Press the << soft key. 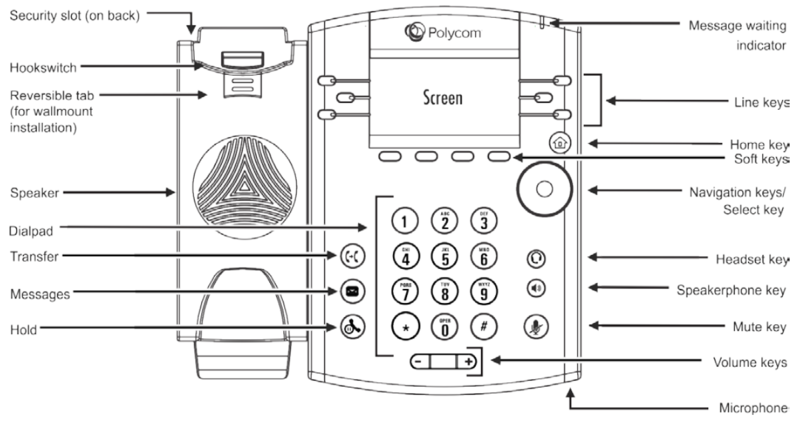 How do I use the Polycom phone? Can I join a teleconference on my Polycom phone? What kind of headset should I get?